* Vitex Extract is particularly beneficial for premenstrual stress syndrome. * 60 counts per bottle. 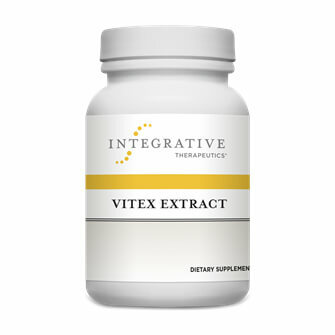 Vitex Extract is unique because each capsule is standardized to provide 0.5% agnuside, chaste berry’s most significant compound. Chaste tree berry extract is a source of phytoestrogens and a popular herb among women who need extra support during premenstrual and menstrual cycles. Vitex Extract is clinically-studied to help relieve symptoms of PMS. * Vitex Extract is unique because each capsule is standardized to provide 0.5% agnuside, chaste berry’s most significant compound.